Stanley Cup winner Kevin Westgarth scored on his debut as the Belfast Giants beat the Cardiff Devils 7-4 at the Odyssey Arena on Saturday night. The win was overshadowed by an early injury to netminder Stephen Murphy, the extent of which is not yet known. Andrew Dickson proved an able deputy as he produced an outstanding display. 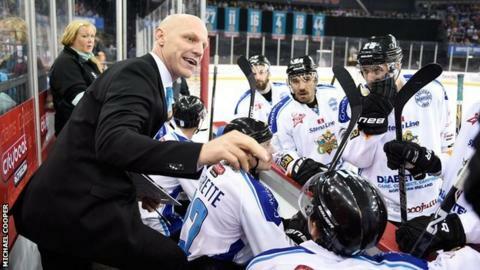 Darryl Lloyd, Colin Shields, Kevin Saurette (2), Calvin Elfring and Adam Keefe were the other players on target for Steve Thornton's side. The game could not have got off to a worse start for the Giants with Murphy having to leave the ice after only 31 seconds following an awkward save from Joey Haddad. Tests will be carried out on Murphy to discover the extent of any injury and coach Thornton will be hoping it is not serious. However Dickson came on to the ice and immediately made a string of excellent stops and allowed his side to take the lead at 4:38 when Lloyd scored at the second attempt. The home side looked comfortable but at 17:53 they coughed up a sloppy equaliser when on the powerplay. Robby Sandrock's attempted pass took a deflection off Jesse Mychan and looped in off the back of a helpless Dickson who knew nothing about it. After receiving a standing ovation when he was announced at the start of the game, Westgarth put his new side ahead at 24:05 when he was found by Ray Sawada's pass and provided the neat finish. The game became very physical when Keefe and Josh Batch dropped the gloves and got the crowd on their feet with a spirited fight and that led to a number of penalty calls on the Devils that the Giants took advantage of. Skating 5-on-3 Shields fired a wrist shot high into the net at 28:32 and still on the powerplay 28 seconds later Saurette tapped in to make it 4-1 after the puck took a funny bounce off the glass behind the net leaving the Devils goalie Ben Bowns in no mans land. The penalties continued including a 5+game for boarding for Lloyd and Clarkson closed the deficit to two goals with 20 minutes remaining. The Giants appeared to have sealed the points when Elfring scored on the powerplay just 26 seconds after the restart and five became six soon after when Keefe fired home. But quick strikes from Clarkson and Tyson Marsh gave the Giants cause for concern before Saurette rounded off the scoring with the empty net goal. The two sides will meet again in Cardiff on Sunday night.